My lovely lady friends and I got together yesterday to participate in the Canning Across America "Canvolution." Nicole is ultra deft in her pouring abilities. We opted to make spiced poached pears. They were gorgeous- we steeped them in a thyme-infused simple syrup and then swaddled them with bay leaf, black peppercorns, a bay leaf, and a crisp white wine topper. Come winter, I'm jazzing mine up with port and parking my rear in front of the wood stove. Bring it, arctic blasts and cold snaps! I am PREPARED! We feasted on everyone's brunch potluck offerings while the jars processed, including: mimosas; lemon pistachio pesto on market fresh bread; cucumber & yogurt soup with mint, cumin, and dill; fresh peaches & raspberries with Jenny's granola, and Beth's blueberry crumble bars. Jenny, a fellow beekeeper, also generously shared honey from her first extraction. Golden, exquisite nectar-so good, we drizzled it straight into our mouths! Wild times! The recipe we used can be found here (word from the wise: peel your pears before attempting to halve them, as indicated in the recipe, unless you enjoy the sensation of slicing skin from your palm...). If you've never canned with friends before, I highly recommend it. Much like knitting circles or book clubs provide socialization and productivity, canning shindigs leave everyone feeling socially revitalized and homeward-bound with bottled-up memories of good times! This is what speaks to me, everyday. A few shots from around and about the English grounds. *Small Measure: Find beauty where you are. It's everywhere, no matter where you're calling from (this post's title is based on a Raymond Carver short story as well as a collection of short stories by the same name; R.C. is an old favorite, a sort of Tom Waits literary kin). I love to can. Really. I even wrote a book about it, so, there's legitimate proof as to my fondness for the technique. Like any intense relationship, though, sometimes things get a bit overheated and a cooling off period is necessary. It just happens. I live in the southeastern U.S.. It's August. My house has no A.C.. The south is known for its humidity. Accordingly, my canner and I took a break this week. We forged other alliances, tried out new things. Confident in the unshakable certainty of our relationship, we enjoyed other activities, knowing we'd merge again soon, when the cloud of hot, heavy, nasty air moved on and we could breathe around each other more easily once again. It's a short-lived break, but a necessary one, for both of us. What did I discover during my canning time out? One word-gazpacho. I love the sound of it, gaz-PAH-cho. Like a confident, saucy Lady, perched languidly on a bar stool, dressed in a red dress and 4 inch heels, sipping sangria. Were gazpacho human, it would no doubt look just so. My garden is busting out, pouring forth a scandalous display of veggie booty. It's finally high season in the soil-the tomatoes are turning red (and gold! ), cucumber vines are running all over each other, the zucchini is putting out fruit faster than I can harvest it. Peppers, herbs, yellow and winter squash, pumpkins, japanese eggplant-it's a wild, happy mess out there. Since I'm seeking comfort elsewhere this week (see above), gazpacho seemed like the perfect solution for using up all this veggie madness in an efficient and delectable (and time sensitive) manner. Blessed as I am with a husband whose inner Julia Child knows no limits, we feasted last night on the best gazpacho ever to pass my lips. THE. BEST. GAZPACHO. EVER. Perfect in all the right ways. Full of flavor, texture, heat, acid, zip, and twang. Groan-worthy, in fact. Should you find yourself with veggies all up in your business and a need for a canning time-out, whip this up. You'll be glad you did, and your relationship (with your canner, that is) will be all the better for it. *Thanks to the incomparable chef G. for this, who serves me heaven on a plate every night folks. Every. Night. -Heat olive oil on medium heat. Add onion, garlic, pepper, carrot, and celery. Cook for about 1 to 2 minutes, then turn the heat down to the lowest setting. Cook for two more minutes, then add tomato juice and stir. Turn heat back up to medium, then cook 4 more minutes. Set aside. -Pulse tomatoes a couple of times in food processor till chunky. Spoon out tomato mixture into a large mixing bowl, till food processor is left only half full. -Add tomato juice/veggie/and oil mixture to food processor. Add chipotle sauce, salt, ground pepper, cumin, Worcestershire sauce, lime juice, vinegar, and fresh herbs (if using). -Pulse a few times till blended, but still a little chunky. -Add to bowl containing reserved tomato puree. -Add diced cucumber, and stir. -If possible, chill for 20-30 minutes. My small measure column today over at Design Sponge is all about canning-questions, concerns, parties. Come find me there...and feel free to share your canning triumphs and travails here! Verve magazine is an exceptionally well produced, Western N.C.-based publication by, for, and about women. Yours truly was mentioned in the July/August 2009 issue. I've printed the article in its entirety below. Known locally as The Egg Lady, Cruser has been “chickening” since a neighbor gave her a hen and a rooster for Christmas in 1972. Although she was several decades ahead of the curve, she’s hardly alone today in her dedication to a higher standard of eggs than those offered in most grocery stores. A perfect storm of economic downturn and increased interest in local food and sustainable living has spurred a dramatic uptick in the number of backyard chicken enthusiasts nationally, and Cruser is now just one of many women in the Asheville area who count chickens among their chief passions. When you think about it, it’s a logical progression. Raising chickens lets those who are not willing to buy the whole farm get one Wellie-clad foot into the world of agriculture without leaving city life behind. Female chickens are relatively low-maintenance: no crack-of-dawn wake-up calls like those emitted by their male counterparts, roosters; no bursting udders demanding to be milked round the clock. And yet, they provide green-minded individuals a little more challenge than, say, a row of lettuce, and a little more warmth and interaction than a hive of bees. And then there are the eggs. According to a recent Mother Earth News study, free-range organic eggs have one-third the cholesterol of those from big commercial chicken farms, and a quarter of the fat, while providing two-thirds more vitamin A and three times the vitamin E. Cruser says what goes into the chicken makes all the difference in the egg that comes out. While the “rainbow” colors of her eggs are the result of each breed’s genetic programming, the large, saffron-colored yolks and thick egg whites can be attributed to her chickens’ all-natural diet. “I spoil them,” she says. Candler chickener Ashley English concurs that special treatment results in happy chickens and high-quality eggs. Her five chickens are coddled, she says, living in a retrofitted dog run she and her husband call the “chicken palace” and eating raisins and parsley, among other healthy foods. “I hug and scratch them and give them lots of attention,” she says. In return, her “girls” produce four or five tasty eggs per day in the summer and two to three in the winter. A relative newcomer to chickening, English has had her flock for about a year, but has already written a book manuscript about her experience to provide other newbie chickeners with tips on getting started. If Asheville City Chickens, now known as the “chicken club,” is any indication, she’s got a big audience hungry for just that kind of information. Started last year by Asheville residents Cathy Williams and Jenny Mercer, the organization has more than 400 members in its Facebook group and more than 100 on its listserv. Williams, Mercer and their tech guru Josh O’Connor send frequent Tweets to local chickeners about topics of interest. Around 40 people showed up for their first Chicken Meetup last May. Chickeners (who showed up sans chickens) discussed the new city regulations and how to get started chickening while sharing stories about their own flocks. Mercer’s run-in with local animal control regulators and Williams’ interest in animal welfare issues were the original impetus for the group: both wanted to promote “responsible and humane ownership of chickens” within the city. Once they started to organize, they found they had a much larger community that shared their goals. With the help of some great communications and marketing tools (including their insider’s-joke bumper sticker motto “We Still Lay”), the group spent the better part of a year preparing to lobby Asheville’s city council to loosen restrictions on backyard chickens. When the issue came to a vote in late April this year, 120 chickeners showed up to voice their support. The group now has 47 chicken-raising members. The measure passed, and now chickens can be legally kept in Asheville within ten feet of a chickener’s home and within 50 feet of property lines (as long as permits are secured and regular inspections take place). The other caveat: no roosters. The group gives members tips on how to approach neighbors “in a way that instills confidence” and prevents conflict. Williams says that before she brought in her own flock, she and her neighbor had a frank discussion about worst-case scenarios, arriving at solutions for each. It didn’t hurt, she says, that they negotiated a little “eggstortion”: a regular supply of fresh eggs to sweeten the deal. Cruser thinks it’s wonderful that there are so many new converts to chickening. Now that she has grandchildren to compete for her attention, she’s cut back the size of her flock from 250 to 135, but her remaining hens produce about 16 dozen eggs a week. Earth Fare store manager James Saldutti reports her eggs sell out almost immediately. “She’s got quite a following,” he says. Those who want to take a crack at producing their eggs can go on Asheville City Chickens’ own “coop tour” this summer to get ideas, or read English’s book Homemade Living: Keeping Chickens With Ashley English, which will be published by Lark Books in April 2010. Ready or not, urban chickens may be coming soon to a backyard near you. For more details on Asheville’s “chicken club,” go to ashevillecitychickens.com. To read Ashley English’s blog, go to small-measure.blogspot.com. Alright, everyone, it's showtime! The winner of this month's Small Measure Can-Do giveaway is Evie! All 47 entries were plugged into a random number generator and Evie's entry takes the cake, ur, the marmalade, this month. Thanks to all who entered. I adored reading your preferred means of cherry-chomping immeasurably! Mark your calendars for September 7th. I'll post that month's delectable canned good then. As I've mentioned before, I'm fortunate enough to have some truly magnificent lady friends here in the mountains of North Carolina. I was again reminded of this last night, when, in the company of a group of both new and long-established lovelies, we laughed, conspired, cackled, imbibed, and chowed down. Liz White, costumer-extraordinaire (she makes wedding dresses, too, AND she has 14 chickens in her urban backyard! ), opened her home for a girl's night-in. We all brought a little something to nosh on, while Jen whipped up exquisite cocktails (ginger brandy-need I say more?). Meg, Alisa, Nicole, Jenny, Kelly, Janell, Sara, and co. all offered up their special something or other. Me, I brought rosewater, cardamom & pistachio rice pudding. It's my go-to pudding of choice; it couldn't be easier to make and it combines all of my favorite flavors in one pot. Invite your favorite ladies over, whip up a pot of this pudding, and enjoy the easy laughter that comes from good times with inspiring friends. *Recipe from here. Keep in mind that this is a traditional Indian rice pudding, meaning it will be both lighter (i.e. more liquid) and less sweet than western rice puddings. In my mind, those are assets, not drawbacks. -Boil rice and 2 cups water in a medium pot over medium heat for 5 to 6 minutes, or until rice is about one-quarter of the way cooked. Drain well and set aside. -Add sugar, almonds, ground cardamom and nutmeg and cook for another 5 minutes, stirring constantly. Remove from the heat and set aside. Stir in rose water. Transfer to a serving dish and garnish with grated nutmeg, if you like. Serve warm or chilled. I have a visitor. While it should come as no real surprise, given that I live way at the end of a dirt road, in a forest, surrounded by a 350 acre nature preserve of more forest, I have to admit that I wasn't quite prepared for my visitor. To begin, I wasn't properly dressed, which is so important when greeting new guests, I've always maintained. Specifically, I was wearing my bee suit, like so. I was also wearing knee-high rubber boots. When my visitor arrived (we'll call her "Maude", or, on the chance that this might be a male guest, "Seymour"), I had just finished working in my bee hives. I was enjoying the late afternoon summer breeze and waning sunlight. Suddenly, my dogs were in hot pursuit of something, dashing up the mountain. I lumbered after them, rappelling myself up a steep embankment, grabbing onto skinny, slippery tree branches for support (still in my bee suit, plus gloves, mind you). When I reached the top, I saw them chasing a black, rather large creature towards me. I thought, "Oh, they've found another dog to play with." This quickly morphed to "Oh, that's a wild boar," immediately followed by "Oh, &#%*, that's a bear!" And so, against all the advice I have ever heard about proper bear-greeting etiquette, I fled, in holy terror. Fled is actually an inappropriate descriptor; trudged, plodded, and clumsily, heavily ran are much more fitting descriptions of my attempt to high-tail it back up the hill to my house. Like I said, I wasn't properly dressed for receiving company. The long and short of it is that, yes, we have a bear. Where there are bees, and corn (our landshare farmer has corn planted in the field below), and forests, it is entirely likely that there will be bears. Black bears are really rather benign, as far as bear dispositions go. Nonetheless, its presence necessitated a trip to the Tractor Supply store last Monday to pick up all the fixings needed for electric fencing. Our friend, the mighty of strength and generous of spirit Lance Graves, came over that evening and tricked out our new fortress in no time. On his way out, he said the bear crossed the driveway, and, to his experienced eye, probably weighed 250 lbs.. The lesson learned from this experience is that urban (and especially rooftop) beekeepers have it made. Also, an ounce of prevention (and some common sense about living in an environment that bears share) is worth a pound of honey. Oh, and don't try running in your Wellies; it just brings all those dreams where you're trying to run and can only creep along frighteningly to life. *I didn't stick around long enough to grab a snapshot of Maude (or Seymour), but the photo above seems pretty accurate, if memory serves me correctly. I don't know if I could be more thrilled to share with you an exciting bit of news. As of today, I'll be hosting a weekly column, every Friday, over at Design Sponge. Entitled "Small Measures," it will feature bits of this and that related to treading a bit more lightly on the planet; much of what I already do here, only with a whole new group of readers to get to know. Please check it out and let me know what you think! And a HUGE thanks to Grace Bonney, Design*Sponge's go-getter extraordinaire, for the opportunity to join your team. Next time I'm up in Brooklyn (or you're down my way), we'll clink glasses, real-time! *While a good number of you already know me personally, for those of you that I'm only just getting acquainted with, feel free to learn a bit more here. Around my house, we eat eggs for breakfast about every other day. Scrambled, frittata-ed, omelet-ized, poached-Glenn crafts up any number of egg incarnations and I happily chow down. On the in-between days, though, when eggs aren't on the menu, I'm usually in charge of cooking up the most important meal of the day. During the cooler months, that is almost always steel-cut, or Scottish, oats. Slow-cooked for 30 minutes, I ladle up hearty bowls of oats, and adorn them with honey, milk, and a sprinkle of cinnamon and nutmeg. In the middle of summer, forget about all that hot-bowl-of-dense-oats business. I still want hearty, only minus the heat. -Preheat oven to 300 degrees F.
-Place all ingredients except for raisins and apricots in a large bowl. Stir to coat evenly. -Spread mixture evenly onto a large, rimmed cookie sheet. -Bake for 45 minutes, stirring every 10 minutes. -Remove cookie sheet from oven, cool 10 minutes, transfer contents to a large mixing bowl, add raisins and apricots, and stir to combine. -Store in an airtight container and muncha-muncha! O-kay, folks, it's time again for another Small Measure Giveaway! For those of you new to the contest, or to this blog, I'm staging a giveaway the first Monday of each month from now until the release of my book, Homemade Living: Canning & Preserving with Ashley English. Each month one lucky person will win an artfully crafted canned item featured in the book and made by yours truly. From my pantry to yours, this month I'll be giving away a jar of Cherry & Lemon Thyme Marmalade. Equally as delicious sandwiched between layers of lemon cake as it would be served alongside a pork loin, this condiment works its way beautifully into whatever you're serving! It also highlights cherries, which are at their absolute peak of ripeness right now. 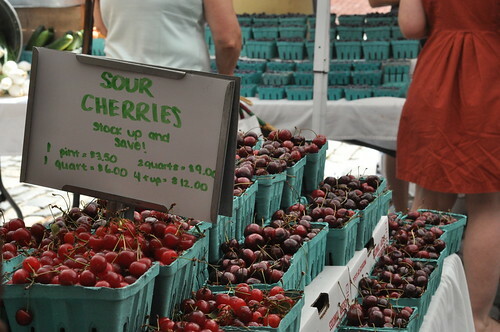 Ah, summertime and the living is easy-and the cherries abundant! To enter: Simply leave a comment to THIS specific post by telling me your favorite way of cooking, serving, or simply eating cherries. Your comment MUST link to your particular blog or web site (and therefore to your contact information) or include your e-mail address. Otherwise, I won't be able to get in touch with you if you win. Any entries that do not include some way of getting in touch will be disqualified. Deadline: Comments must be received by midnight EST August 17th, 2009. Odds of winning will depend upon the number of eligible entries received. If you'd like an exercise in overcoming fear, trying opening a hive of 30,000+ bees, scraping off some of their comb (for maintenance), and then lifting up a few frames for a look-see. I can understand their agitation. If some giant came into my home, rooted around in my pantry, and then decided to take a long look at my babies, I might have a few choice words to say as well. My neighbor and fellow beekeeper Cindy came by today to help me remove "burr comb," the comb honeybees form in between frames. While they are simply looking for more space for honey storage, burr comb is a hassle to the beekeeper, as it causes the frames to stick together, hampering access. It's a concern for the beekeeper, not the bees. We got the burr comb off, though, and I was able to view a vacated queen cell, drone cells, brood (baby bees in the making), capped honey, uncapped honey, newly formed honeycomb (oh, the smell, folks, THE SMELL!!! ), and about a jillion active, albeit peeved, honeybees. While my heart never did pound feverishly in the midst of the hype, I did sweat like the dickens. It's intimidating, all that buzzing and movement and, well, LIFE! I'm there for them; I'm there advocate, their steward. I want to do right by my bees, and for my bees to do right by me. I'm finding one of my favorite things about tending to the bees is actually the way my fingers smell after I've lit my smoker, sort of a cross between a campfire and a high-end cigarette. It takes me places, places long since forgotten, hidden down memory lane. May your week ahead be pure bliss. *Small Measure: Plant flowers for bees! If you have access to some grass or lawn or even an abandoned lot, stoop, or balconey (even a median strip will do! ), consider sowing some nectar-producing seeds for honeybees and other pollinators. They're particularly found of bee balm, mint, anise hyssop, borage, catmint, echinacea, buckwheat, yellow mustard, and basil. Bees get a source of food for transforming into honey, humans gain access to some amazing culinary and medicinal herbs-everyone wins!